Bangalore, or it should be called now, Benguluru, is the Silicon Valley of India. In 1983, Infosys setup an office in Bengaluru and over the next 30 years, other IT behemoths and multi-national corporations made Benguluru their home. Taking the cue from earlier geniuses like Walt Disney, these companies built huge corporate campuses hoping to build communities of young graduates and catering to their every need. Bengaluru, unfortunately was not ready for the great migration. The infrastructure lagged behind and with the lack of any proper city planning, the city crumbled into one chaotic, traffic ridden mess. That is Bengaluru. That is, however, not Bangalore. Talk to the old timers, the Kannada or Tamil speaking communities in Jayanagar and Malleswaram, the English-educated, generation x, born and brought up in Indiranagar and you will hear fond stories of a city that was cooler than any other, of a city teaming with Hawaiian like gardens, and of a city rich in culture and heritage. This is the Bangalore, I wanted to find. Over the last few trips, I am of the belief that it does, still, exist. One just needs to weather the boring, copy cat cultures that is non-native to Bangalore and look underneath the veil. As you know by now, I don’t do vacation without food. Start your day off, bright and early in one of the most relaxing spots in the city, Cafe Max. On the 3rd floor, of Goethe Instiute / Max Mueller Bhavan in Indiranagar, this rooftop restaurant offers perfectly crafted pancakes, omelettes and french toast along with plenty of fresh breeze and wooded tree top views. With energy to start the day, head out to the Panch Linga Nageshwara Temple in Begur. By most accounts, and by my own research, this is probably the oldest temple in Bangalore. Two shrines within the temple complex, the Nageshvara and Nageshvarasvami were commissioned during the rule of Western Ganga Dynasty. An old Kannada inscription, dated c. 890, that describes a “Bengaluru war” was discovered in this temple complex and is the earliest evidence of the existence of a place called Bengaluru. The temple complex itself is undergoing major renovation with outer walls and new entrance gopurams being built, but the 1000 year old inner halls and shrines are still well preserved. The nandi mantap is a open hall with six pillars with a decorated ceiling, while the walls of the temple are sculpted with numerous scenes from folklore and mythology. The temple is situated on the banks of the Begur Lake, and while the rest of the area is very underdeveloped, especially for an area that falls within urban Bangalore, the temple complex and the lake seem to be well maintained. Sitting by the lake, or inside the temple does give you a sense of being in a different, ages old Bangalore. Head out to lunch, at Kebabs & Kurries (K&K) at the ITC Gardenia Hotel. Rated as the top restaurant in Bangalore by Tripadvisor, it is certainly worth a visit to taste what I regard as the most authentic tasting cuisine of north India, and probably the best Dal Bukhara outside of Delhi. Their kebabs are also very juicy and flavorful, and their breads were very well done. The desserts are simply outstanding. The restaurant is expensive, maybe even over-priced by world standards and definitely by Indian ones, but given the quality of the food it is worth visiting for occasions. Outside the restaurant, but within the hotel is Fabelle Chocolate Boutique, where you can pick up some macaroons and rich dark chocolate bars to munch on at your next stop. What better way to digest all those calories from rich, buttery food, than to walk it off at Lalbagh Botanical Gardens. Commissioned by Hyder Ali in the 18th century and completed by Tipu Sultan, his son, this is one of the most beautiful tourist spots in the city. The garden has thousands of species of plants, brought from all over India and the world, and serves as a migratory home to an ever increasing species of birds. With an intricate watering system for irrigation, this garden is aesthetically designed, with lawns, flowerbeds, lotus pools and fountains. Most of the centuries-old trees are labelled for easy identification. The Lalbagh Rock, one of the oldest rock formations on earth, dating back to 3,000 million years, is another attraction that attracts the crowds. Lovers gather here and with sweeping views of Bangalore from the top of the rock, and a colorful sunset, who can blame them. The garden also houses a glass house, and many flower shows and exhibitions are held here each year. Bougainvillea plants adorn the pathways and go hand in hand with the colorful macaroons in your bag. Dinner needs to be fuss free after the fine-dining at lunch, so hit one of the chaat stalls famous in Bangalore for some mouth watering pani puri and bhel puri. Karthik’s or Delite Chaat in Indiranagar and Sri Venkateshwara Sweet Meat Stall in Jayanagar offer different experiences and different styles of chaat but equally yummy. Late night ice cream is the best kind, and so head to Corner House, a joint that is sacred to anyone independent enough to buy ice cream in the 90s in Bangalore. Death by Chocolate is the perfect dessert. Start with idli, masala dosa and vada (if you come early enough) at the Bangalore institution Mavalli Tiffin Rooms or MTR as it is known. The location on 100 ft road in Indiranagar is quaint with good service. The restaurant has its origin in 1924 when a set of brothers from Udupi opened a restaurant serving coffee and idlis and over the next few decades, excelled at their skill. In the 50s, the cafe was renamed MTR and since then haven’t stopped serving food, and have become a household name. Anywhere in the world, MTR branded retail food products are now available. Less than a kilometer from the restaurant on CMH road is Indiranagar’s Metro Station. This mode of public transportation is new to Bangalore, and only one line is functional, but it is a great start. If they can accelerate the pace of expansion, and increase the service, this might help lighten the traffic chaos on the roads. Take the metro one stop to Halasuru (Ulsoor). 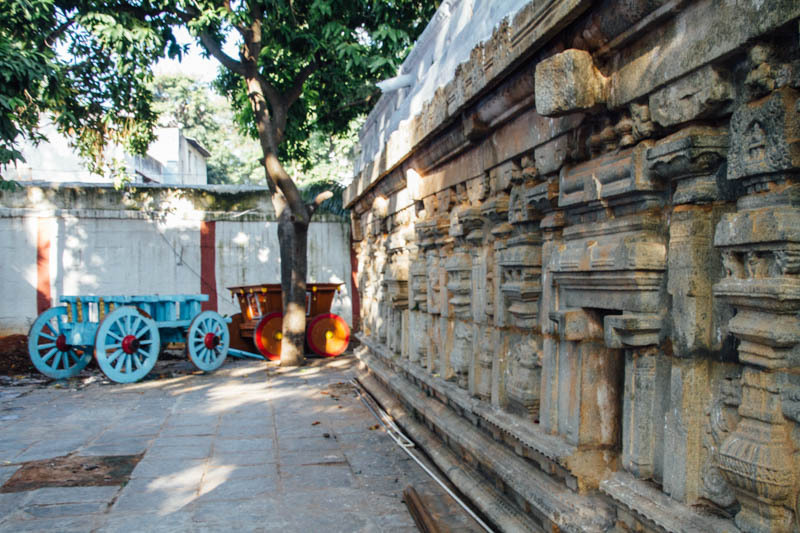 350 meters from the Halasuru Metro station is the Halasuru Someshwara Temple, built by Kempe Gowda I in the 16th century and is a mixture of Hoysala, Chola and Vijayanagara architecture. There are several notable sculptures and decorative features in the complex. An impressive pillar (kambha or nandi pillar) stands near the tall tower over the gopuram. The gopuram itself is one of the most beautiful, exhibiting well sculptured images of gods and goddesses from Hindu mythology. The open mantapa consists of forty eight pillars with carvings of divinities in frieze along with detailed carvings of various animals. While the streets around the temple are crowded, the high walls of the temple, the open space within, the swaying coconut trees, the feeding pigeons, the early sunlight filtering in through the columns all lend a few minutes of silence and serenity to the mind, body and soul and in that, achieves what temples have always aspired to, an escape to find yourself. The temple is very well preserved and large, and as a functioning temple, follows the same timings and rituals. Be sure to visit before it shuts for the afternoon. Theresa May, the British Prime Minister visited the temple in 2016 while the Canadian Prime Minister and his wife reaffirmed their marriage vows, exchanging garlands at the temple in 2012. Take the metro a few stops further down the line to Cubbon Park. A 300 acre, green space, providing Bangalore with much needed oxygen, is the city’s equivalent of New York’s Central Park. It was created in 1870 and is home to many Silver Oak and Gulmohar trees. Monkeys visit often so watch your open food, and there is plenty of playgrounds and even a toy train to keep the kids engaged. If the season permits, boating is permitted in the lake within the park. At the entrance to the park, the Karnataka High Court building stands in bright contrast to the green trees, a stone structure in an intense red hue with Corinthian columns and a Gothic Style of architecture. It was built in 1864 A.D during British rule, and is known as the Attara Kacheri. An easy walk from Cubbon Park (or one stop on the metro) is the Vidhana Soudha, the most ambitious, imposing building in Bangalore. It is the seat of the state government, with bold letters claiming “Government Work is God’s Work” at the front of the building. It was built in 1956 by Kengal Hanumantaiya, an engineer who visited many parts of the world, drawing inspiration. The Vidhana Soudha has four floors above and one floor below ground level and is the largest legislative building in India. The central dome, 60 feet (18 m) in diameter, is crowned by a likeness of the Indian national emblem. Inside the complex is a large statue of Mahatma Gandhi while a statue of Dr. Ambedkar, points fervently forward to move the country towards progress. On weekends the building is illuminated. Another metro stop away is M.G.Road, the nerve center of Bangalore. Many office buildings, along with restaurants, shops and galleries line this avenue, while cricket stadiums, and army clubs provide a natural boundary. Brigade Road, an entertainment district intersects M.G. Road and at the intersection is Cauvery Handicrafts, a great place to stack up on gifts. Grab a quick lunch from the many eateries on Brigade Road, and head to Bangalore Palace. Bangalore Palace is no palace at all, at least not by Indian definitions. It disqualifies itself, having been built less than 100 years ago. In Indian Historic Time, that is nothing. The palace was built by Rev. J. Garrett, the first Principal of the Central High School in Bangalore, between 1862 and 1944. In 1884, it was bought by the then Maharaja of Mysore Chamarajendra Wadiyar X. The entrance fees are steep but once inside, it is easy to get lost in the regal designs. The central courtyard, open to the sky, is uniquely decorated, with balconies that hang over it. A colorful granite bench with blue ceramic tiles sits in the middle, and the rooms around it, still hold pieces of recent history. The rooms are appointed with wonderful wood furniture and the ceilings are painted in colorful motifs. The exterior does resemble a palace with turrets, and expansive gardens. The grounds are used for concerts and some of the most high profile weddings are held here. A royal outing, deserves a royal toast, and one of the newest, hippest joints in the city, is Toast & Tonic. There aren’t too many places in the city where people get dressed up in dinner jackets and sparkly short dresses, but this is certainly one. Run by the same restaurateur who runs Fatty Bao, a tasty, Asian fusion restaurant, Toast & Tonic, offers delightfully whimsical appetizers and finger licking good entrees. But the main attraction, here are the drinks. Gin is primary elixir of choice and the concoctions are artful and sweet yet potent. Men and women can both find something to entice them. It will guarantee to give you a good night’s sleep though how you wake depends on how long you stay and drink. Another morning, and another ancient temple awaits. Check into Chokkanathaswamy Temple in Domlur, a Vishnu temple that dates back to the 10th century. Believed to be built by the Cholas, the temple walls are covered in Tamil inscriptions from the 13th century. Carvings and sculptures still adorn the walls, though most of the temple is now renovated. It is a small temple, quietly hidden away in a residential area, but as always, temples have a way of bringing you there and taking you somewhere else. I was searching for history and found within its walls, a moment n the present and some time to the think about the future. Head across town, an Uber is best, to Gandhi Bazaar, to Vidyarthi Bhavan, a vegetarian restaurant founded in 1943. It is one of the most spoken of landmarks of old Bangalore with its Butter Masala Dosa, making mouths salivate just by its mention. Mention a visit to Bangalore to any old Banglorean and you will immediately receive advice on visiting this institution. The place isn’t fancy, maybe even a little on the opposite side, but the food is made fresh, just a few items every morning, and the tables are wiped and turned over fast. Find the time to make it here. A few kilometers away is the Ashoka Pillar. Jayanagar is one of the most well planned parts of Bangalore. The roads run in crosses, a shopping bazaar lies in its center, residential colonies are broken up into blocks, schools and hospitals are all in the neighborhood and pretty gardens breathe fresh air into this still, conservative part of Bangalore. Today the outer roads of Jayanagar have become the shopping destination for traditional Indian clothing and jewelry. Sari shops like Kanchipuram Silks, Nalli Silks, newer designer fashions from Soch, Neeru’s and some of the most exquisite jewelry stores like C. Krishniah Chetty & Sons and GRT Jewellers all offer the best designs at some of the best prices. India is one of the best places to buy gold and diamonds. Head next to the Infant Jesus Church in Vivek Nagar. The foundation of church was laid on April 18, 1969, by Rev Duraisamy Simon Lourdusamy, the then Archbishop of Bangalore. In May 1971, Rev. Fr. L. Peter after being appointed the first parish priest brought the statue of Infant Jesus from Sacred Heart Church, Bangalore and started a tent church at the site. In 1979, the church finally was inaugurated. The church is one of the most visited in Bangalore, not just by Roman Catholics but by people of all religions. Many believe that prayers here are answered, and many claim of miracles after their prayers. On Thursdays, crowds throng the church, for mass, held in many different languages. Thousands of candles are lit, and then melted away, remade and then lit again. One must believe that the concentration of prayers in this one site has some power and in that power lies one’s beliefs. End the day in Citrus, in the Leela Palace. Definitely not a palace, not even a recent one, Leela Palace is a 5 star luxury hotel, owned by C P Krishnan Nair, who named the resorts after his wife. In 2001 the built the hotel in Bangalore, with 357 rooms, inspired by the Mysore Palace and the architecture of the 13th century Vijayanagara empire, and is surrounded by seven acres of gardens, complete with waterfalls. Relaxing in the gardens sipping tea in china and biting into hot samosas it is easy to forget the congestion outside, and though old Bangalore is hidden away, finding an oasis to hide away from the new one is only a 5 star hotel away. Bangalore, can be difficult to navigate, with its recent non-Kannada negativity, its anti-progressive elements and the constant construction of buildings without supporting city infrastructure, all choking the residents physically and mentally but there is a layer hidden underneath the dust, and one day when the city decides to fight back and clean up, it will glisten with all its old world charm. Next The Fake News Explosion – Reader beware! I wish there was a ‘Love’ button for this post Karthik! Loved the way you captured the essence of Namma Ooru!